[via SlashFood] Cheap wooden chopsticks not quite as stylish as you'd like? Why not bling them up a little by drizzling some gold flakes on them! For the take-away connoisseur that has everything, snapping these in half over your meal will sprinkle gold flakes on the takeaway of your choice. And who says take away on a first date can't be classy? Everyone knows that chopsticks are the most important tools in Japan, so itâ€™s no wonder that there are thousands of variations. Now a specialty store has had an extraordinary idea straight from the days when salarymen were sprinking gold on just about everything: The Kinbashi Gold Chopsticks. 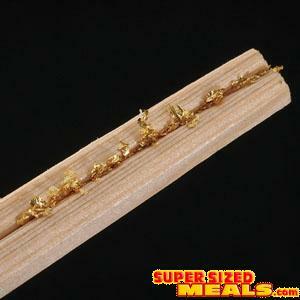 They are not actually made of gold, but the gold is between the disposable wooden chopsticks. 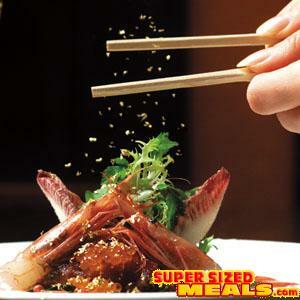 When you separate them, real gold leaf dances down on your meal. Actually, itâ€™s 94.4% gold, 4.9% silver, and 0.6% copperâ€¦but whoâ€™s counting? They arenâ€™t as expensive as you may think, but are still Â¥4,515 ($40) for two five-packs. 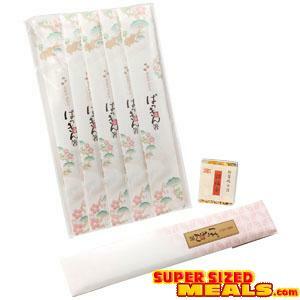 So everybody can feel special while eating with these chopsticks. Top it off with a gold business card, and youâ€™re ready for dinner with the emperor. There is just on question left: What about the nutrient content?